Time to usher in a New Chinese Lunar Year of abundance of joy, good health and prosperity! Indulge in a sumptuous Chinese feast with family, friends and loved ones at Five Sen5es at The Westin Kuala Lumpur this festive season with award-winning Chinese Chef Tan Tzaan Liing 3 exquisite festive set menu from now to 24 February 2019. An important element that never fails to gather everyone together, a Chinese celebration is never complete without a Chinese feast. It is the essential bonding time together to gather everyone to sit down to enjoy a festive meal and create new memories to usher in the new year together. 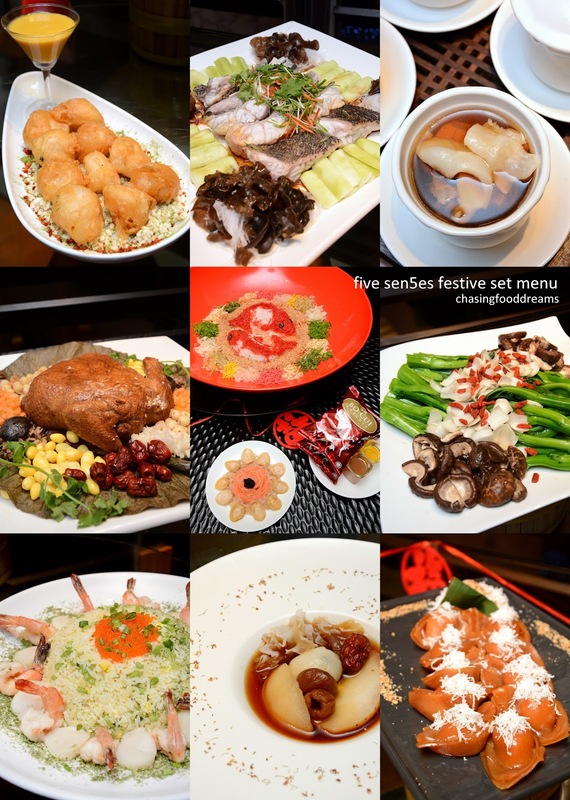 Five Sen5es has always been known for authentic Cantonese cuisine where diners are taken on a sensory dining experience through Sight, Taste, Scent, Touch and Sound in an elegant ambiance set amidst the bustling city of the country. For this Chinese New Year, Chef Tan has curated 3 festive set menu - Happiness Reunion, Blessing Reunion and Abundance Reunion Set Menu along with a selection of fresh Yee Sang, alluring festive à la carte items and an enhanced dim sum brunch, offering a mix of traditional and modern signature creations. While there are classic Yee Sang available, the Baby Abalone Yee Sang with Jelly Fish Yee Sang is one yee sang to indulge when for the festivity. Baby abalones and jelly fish are the obvious highlight among the usual yee sang ingredients along with the house made plum sauce. Tossing as high as possible, this mandatory dish never fails to kick off the festivity and set the mood of ushering in abundance of good wishes for the coming new year along with shouts of ‘lou hei, lou hei’! Another crucial element in every Cantonese meal is soup. Chef Tan is featuring the Double Boiled Chicken Consommé with Sliced Fish Maw, Trumpet Shell and Ginseng as his signature soup for the festive season. Hours of slow boiling has resulted a broth packed with robust chicken essence along with dried seafood flavours. Additional premium seafood such as fish maw or Fa Gao, trumpet shell clam and dried scallop are paired with nutritious ginseng to warm up the body and satisfy the palate. In every festivity, the anticipation of unwrapping a package will always bring an element of excitement to anyone. The course of Steamed Eight Treasure Chicken Wrapped in Lotus Leaf in Dry Scallop Sauce is truly a delicious package to unwrapped. Beautiful whole village chicken stuffed with eight treasures of red dates, dried scallop, gingko nuts, lotus seeds, mushrooms, lily bulbs and more is steamed for hours. The result is a beautiful fork-tender chicken with a nutty and herbal aroma of lotus leaf and herbs in a delicate brown dried seafood sauce. The Deep-Fried Scallop with Cheese and Pumpkin Sauce is not the usual dish one would expect but it is a dish that would easily garner favorable votes of approval from diners of all ages. Golden crispy battered scallops paired deliciously with the nicely balance savory and sweet cheese and pumpkin sauce. The classic nian nian you yue is represented by the Steamed Sliced Giant Grouper with Black Fungus and Luffa Melon. The sublime freshness of the thick giant grouper goes so well with the supreme soy sauce. Textural components from crunchy black fungus and soft pieces of luffa gourd added a lovely touch to the classic dish. Chef Tan focuses on healthy dishes since many diners are now more conscious of health being. The next dish of Wolfberry and Fresh Mushroom with Seasonal Vegetable proved that even healthy dishes like this one can be very enjoyable and delicious. From crunchy kalian greens to earthy plump and tender braised mushrooms, crisp lily bulb and nutritious kei chi, the dish is not only pretty but deliciously yummy. Large prawns, juicy scallops and popping fish roes are the crowning glory to the Seafood Fried Rice with Seaweed. The fluffy egg fried rice is cleverly seasoned with generous sprinkling of seaweed powder for that rich and flavourful umami note. An all-time favorite sweet during CNY is ‘nian gao’ or ‘lin ko’. The sweet glutinous rice cake is almost obligatory in many Chinese household as it signify good luck from the meaning of its name that is translated to ‘higher year’. The culinary team at Five Sen5es makes their own nian gao and creatively shapes them to resemble bundle of precious ingots. The Chinese New Year ‘Nian Gau’ Stuffed with Golden Sweet Potatoes Paste is superb and simply not-to-be-missed! Stuffed with creamy mashed purple sweet potato, steamed and topped with fresh grated coconut, this dessert is such a delectable way to end the festive meal. 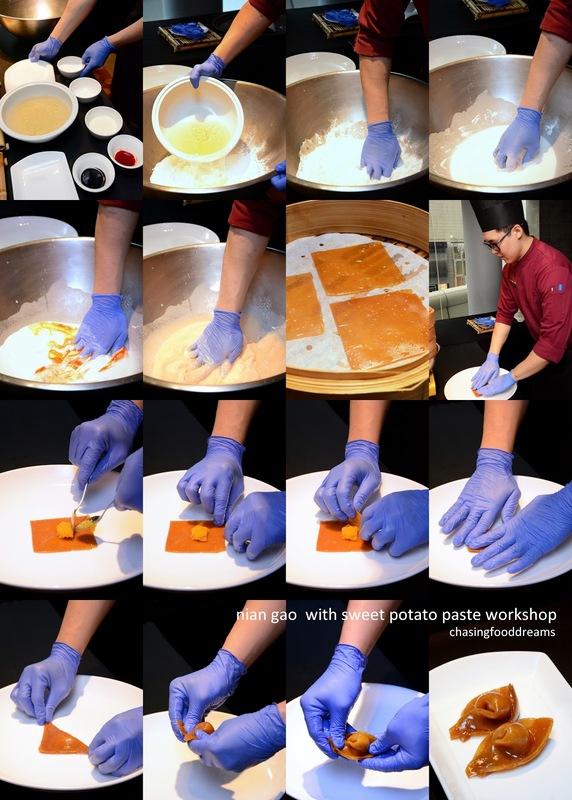 We were honored to be able to catch a workshop with the culinary team on how to make this signature nian gao. It is indeed a tedious process to make nian gao from scratch and each one is hand-shaped meticulously. Nian gao has to be cooked and set prior to slicing and shaping. Once the sliced nian gao is steamed, it has to be quickly wrapped in its tender texture before it is set to cool and steam again prior to serving. For diners who prefers to indulge in the extensive à la carte menu, delight in timeless classics ranging from Oven Roasted Barbeque Duck with Mandarin Orange Sauce, Honey Glazed Baked Black Cod Fish, Wolfberry and Fresh Lily Bulb with Seasonal Vegetables, Chinese New Year ‘Nian Gau’ Stuffed with Purple Sweet Potatoes Paste and assorted Dim Sum to name a few. 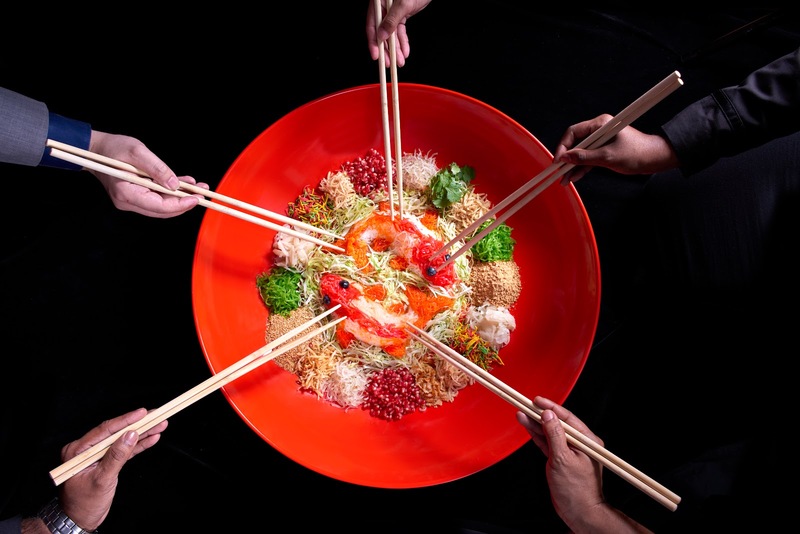 A Chinese New Year dinner will not be complete without the tossing of Yee Sang. Yee Sang is symbolic of good luck, prosperity, health and all things auspicious. At Five Sen5es, Unity Chinese New Year Specialties ‘Lou Sang’ offers a variety of Yee Sang including Norwegian Fresh Salmon Yee Sang and Baby Abalone Yee Sang with Jelly Fish. Diners also have the options to enhance the dish by topping add- ons to the selected Yee Sang. With Chef Tan’s special plum sauce, gather your family and friends and start tossing all the way to abundance of joy and happiness! Yee Sang can be enjoyed by dining in or to be taken away for celebrations in the comfort of your homes with loved ones. Prices start from RM88 nett per standard serving and are available from 05 January to 24 February 2018. · Blackout dates apply. Beyond Dining, Club Marriott members and Major bank cardholders enjoy 20% discount on the above promotion for up to 10 persons from 28 January 2019 to 10 February 2019. · Children aged 6 years old and below dine for free. · Children aged 7 to 12 years old receive 50% discount off food only. For reservations or more information, please contact Westin Dining at 603.2773.8338 or email westindining@westin.com. Please note that All-You-Can-Eat Dim Sum is not available from 5 January to 24 February 2019. Only A la carte Dim Sum menu will be served. Simply Dim Sum buffet will not be available on 03 & 10 Feb 2018 (Sundays) and à la carte menu will be served. *Five Sen5es is a pork-free restaurant.